The K-MPO stores 18 / 12” (33 lb.) FCAW wire spools, 8 / 10 lb. tubes 36” TIG Filler Rod and 600 lbs. Stick Electrodes. 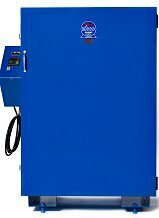 Our floor ovens are the preferred choice for many large manufacturing, fabrication and aerospace facilities where centralized, tight control of welding electrode quality and cost is of utmost importance. Our K-MPO model maintains consuables at ideal temperatures to prevent moisture pick-up and to optimize welds. The K-MPO has secondary storage capacity in the door rack that is capable of storing 8 / 10 lb. tubes of 36” TIG Filler Rod. The door is reinforced with welded hinges enabling to support the weight of TIG electrodes. 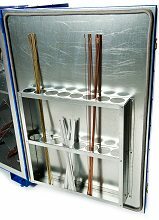 The added TIG electrode storage capability makes the K-MPO more versatile than other products in the market. Adding further to it’s versatility, the K-MPO incorporates the same perforated, angled shelving found on our stick electrode ovens. 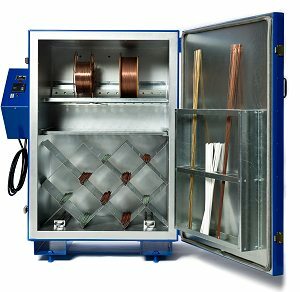 The rack is capable of storing 600 lbs of electrodes up to 18” in length. Click here to learn about our custom shelving. We have the unmatched ability to customize any of our standard ovens, and/or design one-of-a-kind ovens for unique storage requirements. Welding codes are constantly changing, and Keen is ready to meet the demands of today’s welders. 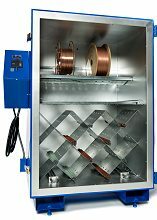 Click here for more information about our products and detailed technical information about welding consumable storage.